We will be at the Boston Local food fest providing one more reason to get tickets and show up. We do however need a few extra hands for the event so we are hoping to wrangle a few local barista to collaborate with us for the event. We have put a lot of thought into the concepts of local, sustainable, and why that matters in an industry that has coffees coming from all over the world. It makes sense that people lump sustainability solely into terms of anything that happens at the farm level or cafe level in coffee. Coffees come from all over the world so it seems like then shipping them across the country is not really that big a deal. Truth is, it really is kind of a big deal. Here's something for you to think about next time you are in a cafe that talks about zero waste or sustainability, where does the coffee come from? Though coffees come from all over the world, maritime or cargo freight by sea has an extremely low cost (and carbon footprint) compared to truck and air freight. The argument can easily be made that coffees delivered by maritime freight to the closest port to a roaster and sold locally are easily the most sustainable model in our industry. Shipping roasted coffee cross country is one of the least common sense habits our industry has developed and adds a lot of costs to the final product. What value could be added to ship a coffee across eight (or however many) states? What quality can be increased by shipping coffee a thousand (or more) miles from roaster to cafe? Short answer, none. Anyone who tells you they can't find a good quality coffee roaster in region or their local metro is not giving enough thought or research to it. There are so many new roasting operations starting up in every part of the country that the argument can be made we are in a renaissance for small batch micro roasters (or the beginning of one). On a quality level, there are big arguments for local roasters like us to stay hyper local in our business model. Bags roasted within days (if not hours) showing up on shelves in locations that we can often bike to. Being able to train, teach, and share with those serving and buying our coffees. You can even easily meet the green buyer or roaster daily to talk about what is special about that farm or how that roast tastes in different methods. 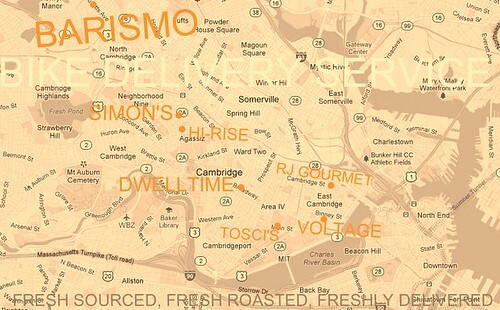 Nevertheless, it's a complex topic that can ponder as you drop our booth the 7th for the Boston Local Food fest. It's going to be fun. Think 'local'. This turned into quite an eventful weekend for all of us at barismo as well as the entire dwelltime staff. Six pallets of coffees were delivered (Just about five TONS of green coffee) for the first time to our dwelltime location in Cambridge MA. We are now able to store many pallets of green coffee in our spacious basement. This will be an interesting logistical challenge for us as we figure out how often green coffee will need to be transported over to our roasting facility four miles down the road in East Arlington. The dwelltime staff, including our baker, had a chance to pitch in hauling 160 pound bags of green coffee from pallet to basement. One of our bar staff was a little gung ho with hauling bags, jute sack versus bare knuckles, jute wins. This however is not a new activity for all of us lightweights down at the roastery. For almost four years now, as of (September 17!) barismo has been in the business of hauling bags of coffee into our cool basement and then carrying them back up small batch at a time to carefully roast and send out our front door. As if that was not enough of a work out, we have just started sending out our local deliveries all along the Mass Ave corridor in Cambridge via our very own bicycle delivery cart. We made an appearance this past Saturday at the Somerville SPOKES bicycle festival to serve up Union Square's most sustainable and most meticulously handled coffee. Some might call us crazy, we like to call it sustainable. As a four year old company we are out of the brand-new phase and into the growing years. We just opened up our beautiful cafe and lunch spot in Cambridge to an overwhelming reception from our friends and new neighbors. At the roastery we are on the verge of moving into a bigger, newer production/cafe/training space. Through all of these years we have successfully been able to grow in a very organic and responsible manner. Our commitment to fostering a genuine connection to the product we handle has come full circle as one of our Direct Trade partner producers from Guatemala is visiting us in just a couple of weeks. I would encourage you to read up on story of how we connected with Gustavo Alfaro, and the leaps and bounds we have made with new micro lot projects at his farm, Hacienda Santa Rosa. Sustainability for us is not some far away concept happening just at the farm level, it is apart of everything we do as a local business. Responsible direct sourcing, micro batch roasting, brewing and training resources, local sustainable delivery, and genuine community involvement. So, join us at one of our many community events to get involved! In specialty coffee, slow and steady is a sustainable pace. barismo's green buyer, Silas Moulton, leads a very informative tasting each Thursday at 3pm at dwelltime. Serving up fresh hot coffee and cold brew each Sunday in Davis Square. Monday, September 17th - Barismo Four Year Anniversary Celebration and Customer Appreciation Day. Free shots of Clockwork espresso at barismo all day long!